Kate McInturff passed away last July 27. Kate was a member of the Coordinating Committee of Social Watch (where she helped enormously to shape our research strategy and gender analysis) and a contributor to the Canadian national Social Watch reports of 2012, 2014 and 2016. A group of CSOs share their long-term experience and knowledge of enhancing sustainable development. 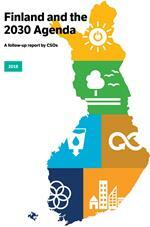 Each of the seven CSOs is responsible for its own area of expertise of the Finland and the 2030 Agenda follow up report. The Finland and the 2030 Agenda follow up report provides information about the state of sustainable development in the country, describes visions about the the future and above all makes specific recommendations for decision-makers to carry out the objectives discussed in the report. The forum brings together all countries annually to share information and to report their implementation of sustainable development. This report is the second in a series of follow-up reports. In the first we dealt with those SDGs which were focused on at the HLPF in 2017. A major part of the inequality picture is increasing market concentration and the accumulation of wealth and economic power in the hands of a relatively small number of transnational corporations and ultra-rich individuals. Intense concentration of wealth and power is in fact inimical to progress across the entire 2030 Agenda. This trend has not emerged accidentally: inequality is the result of deliberate policy choices. In many countries, fiscal and regulatory policies have not only led to the weakening of the public sector, but have also enabled the unprecedented accumulation of individual wealth and increasing market concentration.